LT-300 RGB/DMX Controller with LCD screen, which is dedicated to control entire synchronous color changes of Led lights with 4-pin 3-loop cables (common anode), 36 optional modes, built-in a standard DMX512 decoder to receive universal DMX512 signal. It can work standalone or work with DMX512 devices to receive standard DMX512 signal. It can add power repeater to expand power unlimitedly if one controller is not enough to provide the power output. 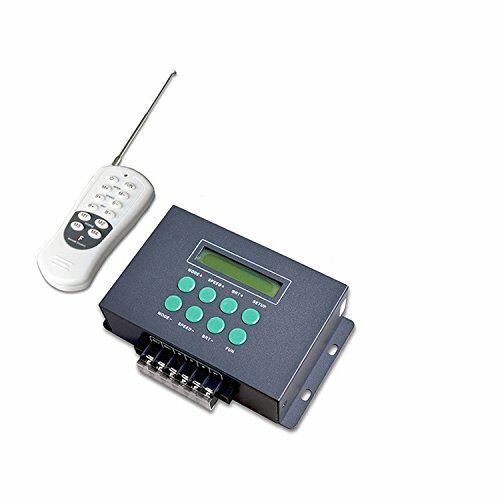 Built-in a LCD screen, easy to set up parameters. Built-in perpetual calendar, real-time display system clock, can be set up to play different programs in any time, Monday to Sunday or holiday. 28 lighting modes, such as, single color brightness, color change, color smooth, and color strobe, etc. Multilevel changing speed, brightness and RGB grey scale adjustment for your choices, 256 brightness levels per RGB(16.77 million static colors). Feel free to define many changing modes into a step, 8 independent cycle steps maximum. Support different input ports like standard XLR-3, RJ45 and Green terminals, etc.